The case before U.S. District Judge Gerald McHugh Jr. was not unlike others he’d seen before. A woman alleged sexual harassment in the workplace so severe she had been forced to quit her job. Her former employer, a global talent agency called MarketSource, was arguing that the whole dispute ought to be in front of an arbitrator—not in a public courtroom. McHugh, sitting in the Eastern District of Pennsylvania, left no doubt about his misgivings, writing “there is legitimate cause for concern when a parallel system of dispute resolution supplants the courts.” But in the face of a growing constellation of U.S. Supreme Court decisions favoring arbitration contracts, the judge concluded in a decision last November that he had little choice but to side with the company. In the wake of the U.S. Supreme Court’s split decision in Epic Systems Corp. v. Lewis, which further bolstered the Federal Arbitration Act, that outcome has been increasingly common for workers who try to take their employers to court. Claims of persistent sexual harassment and discrimination in the workplace, fast-food workers shorted on pay and gig economy contractors fighting for employee status have all been routed to arbitration in decisions citing Epic. In less than a year, the ruling has proven to be a strong weapon for the pro-arbitration defense bar. In collaboration with San Francisco-based legal research company Casetext, The Recorder affiliate The National Law Journal analyzed 92 decisions from U.S. courts of appeal and federal district courts that cited Epic in the seven months between when it was handed down last May and the end of 2018. Among those cases, 10 circuit court and 49 district court decisions centered on arbitration and dealt with workplace claims—and the majority either compelled arbitration or revived it as a live issue. The high court found the arbitration contracts at issue—which required employees to arbitrate individually rather than collectively—were to be enforced as written. Critically, the majority concluded that arbitration contracts that waive an employee’s right to bring class or collective claims do not violate the National Labor Relations Act (NLRA). That finding has rippled through dozens of worker lawsuits, many of which had used the NLRA argument to attempt to nullify agreements to arbitrate disputes. It has impacted headline-grabbing cases, such as a pair of now-unraveled class actions against ride-hail giant Uber, as well as many other suits that would be unlikely to garner much public attention. About 63 percent of decisions citing Epic—across all case types—broke in favor of the defendant, although the fact patterns in many cases differed widely. The bulk of the cases were class actions. 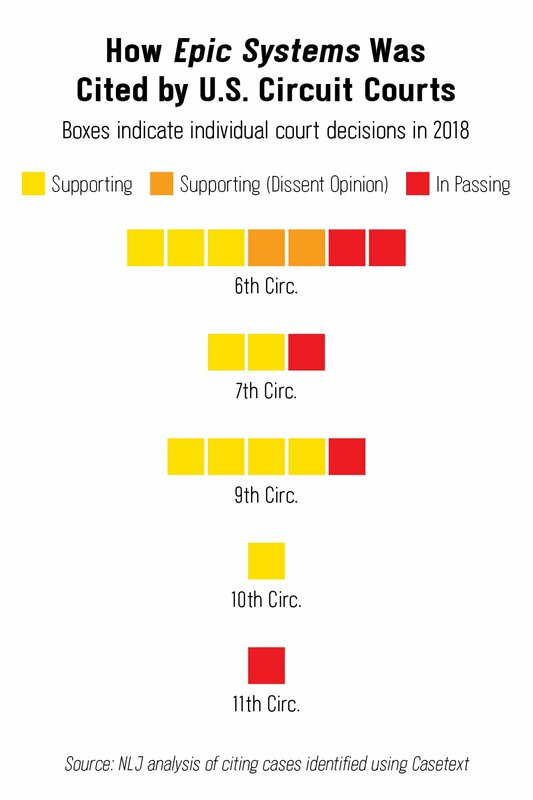 About 53 percent of the circuit court cases citing Epic, and roughly 71 percent of the district court cases, were class actions. Of class actions in both district and circuit courts, 53 percent were compelled to arbitration, and in another 6 percent arbitration was revived as a live issue after Epic. The most common case type centered on wage-and-hour claims, but there were a handful of sexual harassment and discrimination cases, too. Around 47 percent of circuit court cases, and just under 51 percent of the district court cases, were wage-and-hour cases. Other cases citing Epic involved securities claims, alleged credit reporting violations and immigration proceedings. In the district courts, most of the cases centering on arbitration that involved workplace claims—allegations of wage-and-hour violations, sexual harassment at work, workplace discrimination or worker misclassification—67 percent were compelled to arbitration. That accounted for 33 cases. In one additional case, arbitration was revived as a live issue. About 12 percent of decisions denied arbitration, and roughly 18 percent resulted in some other outcome. These findings reflect only a snapshot of the shifting dynamics in courts and companies around the country. State courts have begun taking cues from Epic as well, plaintiff attorneys are plotting their new moves, and employers are adjusting to a new normal while balancing social considerations with newfound legal security. Maatman, commenting on the NLJ’s analysis of cases citing Epic, noted the data would not capture how many plaintiffs dropped claims or decided to avoid the process altogether. The pro-arbitration defense bar arguably already had the upper hand in the wake of earlier Supreme Court decisions in American Express v. Italian Colors Restaurant and AT&T Mobility LLC v. Concepcion. Kalpana Kotagal, a partner at Cohen Milstein Sellers & Toll, said Epic raised concerns because it eliminated the open angles that could provide a clear channel for collective legal action. She said the new process will create inefficiency for both sides. In a few cases, plaintiff firms have sought to beat defense attorneys at the arbitration game by filing thousands of arbitration cases at once, and then demanding that the arbitration fees be paid by the companies up front. Firms representing Uber, ride-hail rival Lyft, and Chipotle face such an avalanche of arbitration proceedings. But the study, which Horton penned with fellow professor Andrea Chandrasekher, suggested this is likely not a lasting strategy for legal battles against corporate defendants. A Push Forward or a Roll Back? Meanwhile, more than half of employers in the country are subject to mandatory employment contracts, and a third of those include class action waivers, according to the Economic Policy Institute. This has risen from 2 percent in 1991 to 25 percent in the early 2000s, to 55 percent of workers today. That survey also found that employees in low-wage workplaces, women and African-Americans are more likely to be subject to mandatory arbitration agreements. Nearly 65 percent of workplaces where the average wage is less than $13 an hour also require these agreements, the study found. The number of companies who use these agreements could increase. After Epic, employers who were “sitting on the sidelines” are now looking to adopt this type of contract with workers, said Kathleen McKenna, a Proskauer Rose partner in New York who specializes in labor and employment. Public sentiment about arbitration agreements has shifted since #MeToo changed the conversation around harassment and discrimination. State and local lawmakers have pushed bills that would restrict mandatory arbitration, and federal legislation has also been proposed to counteract Epic. These factors create a delicate balancing act for companies. Large companies, including Microsoft Corp., Google Inc. and Facebook, recently announced changes to internal policies that either eliminate or make exceptions for harassment claims in the agreements. But few have fully abandoned arbitration and others have taken steps to further enforce these agreements and lash out against employees who tried to file lawsuits. Yet some employment attorneys still predict the trend is likely to move toward more arbitration, not less. Employers turn to arbitration because it can be a more expedient and private process. Noting that arbitration initially gained traction with union and company meditation processes, historically, McKenna said companies continue to prefer it because it limits risk and prevents the possibility of a “runaway jury” award. Andrew Melzer, partner and co-chair of Sanford Heisler Sharp’s wage-and-hour practice, has predicted the practical impact of Epic may be limited if employers continue to roll back some of their mandatory arbitration agreements, including law firms. “There has been a substantial public outcry against confidentiality agreements and arbitration clauses, particularly in the MeToo era,” he said. “In light of the backlash, some employers have been reluctant to impose such provisions on their employees. You can view and download the full data set that we assembled in reporting this story, and take a look at how we conducted our analysis, over on GitHub. Our goal in presenting this to our audience is to “show our work” and promote greater transparency around a legal issue with wide public interest and significance.